Serbia has warned it will defend "every inch" of what it claims as its territory in neighbouring Kosovo. 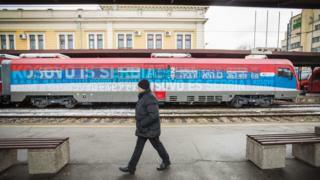 President Tomislav Nikolic accused Kosovo of seeking a war, after a train painted in Serbian colours and the words "Kosovo is Serbia" was prevented from crossing the Kosovan border. Kosovo saw the train as a deliberate provocation. As tensions grew, Mr Nikolic said that he would be willing to send the army to defend Serbs in Kosovo, if necessary. Kosovo, historically a province of Serbia, declared independence in 2008. It is recognised by the US and most EU countries but not by Serbia or its ally Russia. The train - heralded as an important transport link by Serbia - was the first direct link between the Serbian capital, Belgrade, and Mitrovica, in northern Kosovo, since 2008. Many of the remaining Serbs in Kosovo live around Mitrovica. Serbia said the slogan "Kosovo is Serbia" in many languages was a celebration of its cultural heritage, as were the Serbian Orthodox religious symbols adorning the inside, and the liberal use of the Serbian national colours. But Kosovo's Prime Minister Isa Mustafa told reporters that the train had been stopped "to protect the country's sovereignty" and that Kosovo would not allow "machines that will provoke with a message of occupation." Kosovo had deployed police forces along the border to prevent the train crossing over - which forced President Nikolic to order a halt to the service. Serbian Prime Minister Aleksandar Vucic alleged that Kosovan forces were planning to blow up the tracks, and accused them of playing "war games". The incident has heightened tensions, causing protests by ethnic Serbs in Kosovo, and prompting Mr Nikolic to comment that the two nations had briefly been "on the brink of conflict". 2008 - Kosovo unilaterally declares independence. Kosovo has had a constant Nato peacekeeping force since 1999. Tensions with Serbia were already running high, after former Kosovan prime minister Ramush Haradinaj was arrested in France on 5 January. He was detained on a Serbian warrant accusing him of war crimes. Mr Haradinaj has twice been cleared of such charges at the United Nations, but Serbia insists he should be extradited. He remains in France pending a court decision.